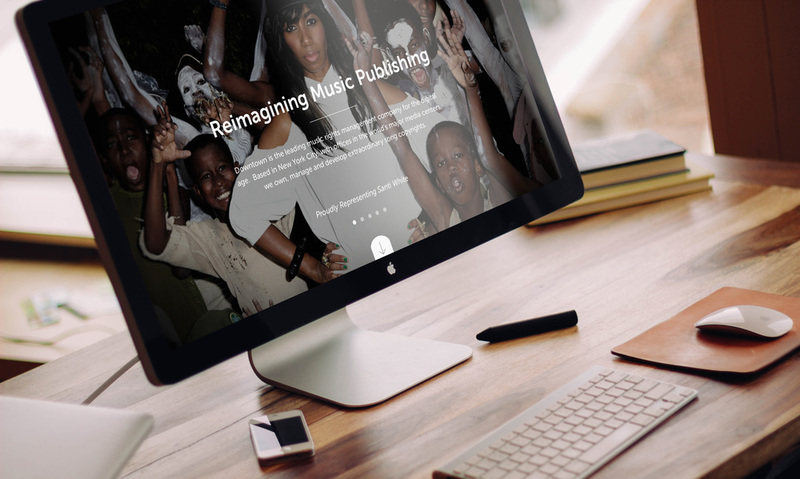 Downtown Music Publishing is a full service music publisher based in SoHo in New York. The company represents writers' and artists' catalogs of the likes of the Cold War Kids, Neon Trees, and Beatles legend, John Lennon. I helped reposition and rebrand the growing company by focusing on market research, brand strategy, and design. The new branding distinguishes Downtown from their competitors by focusing on their main differentiators: making music publishing and royalty collection transparent and easier for their clients. Just like the foundation of their business, the focus for branding and site design needed to be on representing clients and their needs, not just bragging about their long list of talent. The DMP audience includes songwriters, artists and managers, so the branding needed to be professional, personable and innovative enough to draw top talent. True to its name, Downtown Music Publishing was born in the heart of New York City. This was a great starting point for exploration. Thinking about the history and richness of New York's music scene is ridiculous — the birth of disco, Studio 54, the punk scene, Max's Kansas City and CBGB's, the Factory with Warhol and The Velvet Underground... some of the greatest bands and musicians of all time walked these streets. That history, plus images of the architecture, subways and the blur of the city inspired the visual identity. Keeping with the simplicity and graphicness of my findings, I decided to work with a simple black and white color palette, with a pop of yellow as an accent. Focused on evoking the feeling of the vibrant streets of downtown New York and its rich history, I worked to create two versatile marks for the Downtown Music Publishing brand. Downtown needed a typeface that was legible on screen, but also looked great on the company’s collateral. Museo Sans was chosen for its high x-height and its sturdy, geometric characters — making for great readability at any size. Working with the new branding, we created a variety of ads to appear in trade magazines — mostly to congratulate Downtown clients on their achievements. Inspired by the pops of yellow that seem to dot the city, I decided to incorporate yellow into the company's collateral. Bright yellow envelopes, painted-edge business cards and blind embossed note cards all come together to represent the Downtown Music Publishing brand. There's a sense of timelessness and craftsmanship in the details of the DMP collateral, while still feeling modern and fresh. When Downtown contacted me to help with their redesign, this was their site. Although minimal, it lacked brand cohesion and clarity. Our goal for the site was to bring in the new branding, as well as make the user experience more engaging and clear. How could we make this site stand out amongst the many competitors and make a memorable impression on users? • Personable — We care deeply about our clients and they're the focus of everything we do. Photos are the biggest attributors to color on this site, so it was pertinent that we kept consistency with photo direction. Working with images from Downtown's office and artists, two clear styles emerged. Although slightly different, both are within a similar color palette. Deep, dark, and moody. Color images are warm and rich, while B&W images have a strong, dark contrast. Light, hazy, and sepia-esque. Color images have softer colors, while B&W images have a gritty, hazy contrast. The visual direction of the branding and the motivations of the DMP audience helped to guide the site design and interactions. The new responsive site now showcases the new branding as well as clearly displays the company's growing catalog. Strong imagery and clear messaging help make Downtown stand out amongst the competition. The homepage really needed to represent all facets of the brand, as this is the first impression most clients will have of the company. A large, full-screen header showcased images of Downtown's top talent, services and client call-outs were included, as well as a stunning video player with the featured blog post — usually a commercial or movie that used Downtown's catalog. Towards the bottom, the other company branches of Downtown were provided with their own links. We simplified the main navigation based on user needs. We decided to use "Our" to describe each nav item to help make things feel a bit more personable and inviting. Since DMP’s focus is on helping their clients, the entire site revolves around this advocacy. All artists and songwriters have their own profile pages with extensive bios, images, song clips and social connects. Downtown Music Publishing works to not only HIGHLIGHT their talent, but also boost their clients' image and promote them clearly and effectively. The profile pages allow you to get to know artists, as well as writers better. Sure, we're all familiar with Mos Def and his accomplishments, but do you know Sandy Vee? Sandy's a producer who's mixed tracks for Rihanna, Katy Perry, and a long list of top pop stars. Go to his page and you can read more about him and listen to a few of the many tracks he's produced that are a part of the Downtown catalog.